Eighty-eight readers love this post. 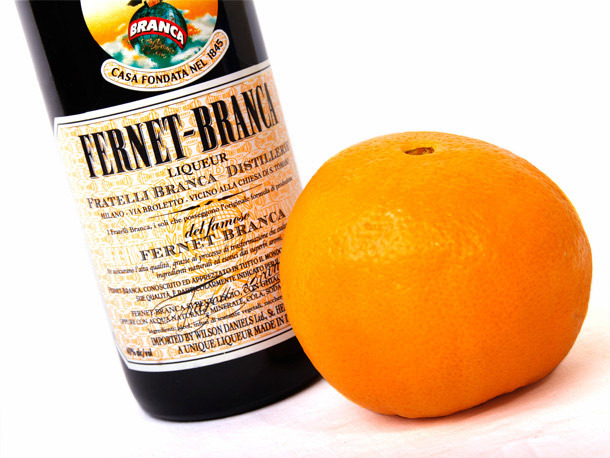 Fernet Branca is usually enjoyed as an after dinner drink but why not incorporate it into cocktail hour or dinner too? This cocktail has an extra special kick by being served in "slushy" form. Who doesn't love a slushy? No one, that's who. The smokey taste of anejo tequila blends with Fernet Branca and the ginger's bitter appeal while everything is balanced by the addition of orange flavored cointreau. Mixing all these bold ingredients with ice to add the slush really helps subtle out the flavors. Blend this baby up for your next dinner party and give your guests a taste of the (new) good stuff. Add more ice as you feel necessary. Less is more to start with. Once the cocktail is a slushy consistency pour into a rocks glass and garnish with peel.